The fruit, in a nylon bag, fermenting in a bucket. Every day, the fruit gets punched down, so all of it contacts the fermenting wine over the course of the fermentation. OK, since the website name is Beer & Wine Journal, I guess I should occasionally post something about wine. Back in 2013, I made a wine I called Cherry Berry Wine because it was made with . . . well, you guess (or see the recipe). Last week, I was shopping at HEB (my local supermarket) and they had the same mix of fruits for fairly low prices, so I got the ingredients for another batch of fruit wine. My previous recipe used over 14 lb. (6.4 kg) of fruit for a 3.0-gallon (11-L) batch of wine. That’s over 4.67 lb./gallon (0.58 kg/L). I added sugar to make an OG around 1.075, when the fermentation stopped (around SG 0.997), that made about 10% ABV. When finished, it was very dark red, and tasted very fruity. It fermented to dryness, so wasn’t sweet and therefore didn’t taste like alcoholic Kool-Aid. Also, I added some wine tannin, so it had some “structure.” It was good, bordering on very good, but at the time I thought that backing off on the fruit concentration would be a good thing. This year, I scanned a bunch of wine recipes for the usual amount of fruit per wine and scaled my fruit amounts back. See the recipe below. I still want the wine to taste strongly of fruit, but not be wasting it. So this time, I ended up using just over 11 lb. 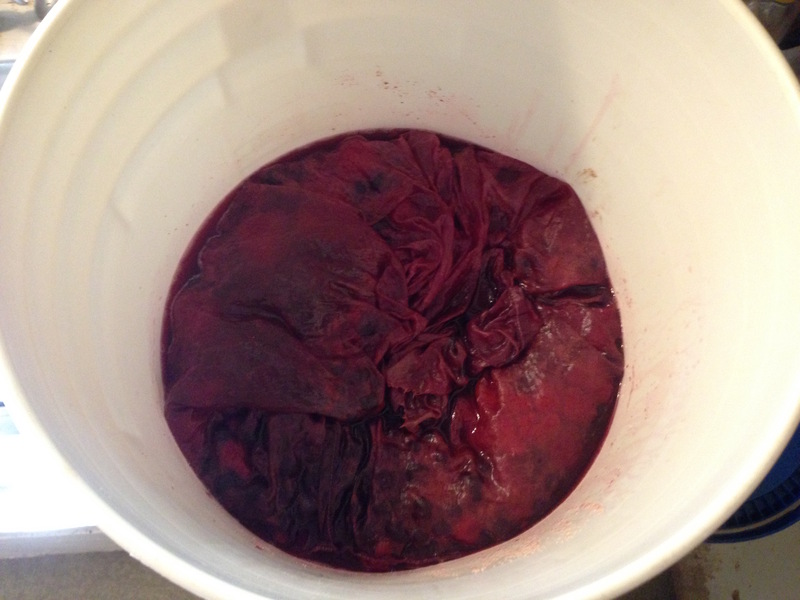 (5.0 kg) of fruit for 4.0 gallons (15 L) of wine, with sugar added to make the wine finish at around 9% ABV. This is just over 2.75 lb. of fruit per gallon (0.33 kg/L) — more than you’d typically add to a fruit beer. After mixing all the fruits, the color of the wine was again dark red, as shown in the picture. (This year, I used frozen red grape juice instead of white as my supermarket had no white juice that day.) The amount of fruit in the recipe is still on the high end of fruit additions in homemade wine. I put all the fruit in a nylon bag, mashed it with a (clean) potato masher, added the sugar, water, tannin, acid, and pectic enzyme (pectinase). After adding Campden tablets and waiting 24 hours, I added the first dose of yeast nutrients and the wine yeast. By the next day (today), it had started fermenting. For the next few days, I will punch the fruit down once a day. This ensures that part of the fruit doesn’t just float on top of the wine the whole time. Once fermentation stops, I’ll rack the wine to a glass carboy. Here’s the recipe and I’ll let you know how the wine turns out. Place clean nylon bag in bottom of sanitize plastic bucket. Add fruit to bag. Mash with clean potato masher. Add sugar. Add tannin and acid. Add pectic enzyme. Add water to make 4.0 gallons (15 L). Crush Campden tablets and stir into liquid part of must (unfermented wine). Lift and dip the fruit bag a couple times. Place lid loosely on bucket and let sit 24 hours. Add one third of the nutrients and the yeast. At peak of fermentation, add the second one third of the yeast nutrients. Then, add final third the next day. Let wine ferment to completion, then rack to carboy. Once the wine clears, rack to bottles. Add 1 Campden tablet per gallon of wine when moving to bottles. You can choose to make the wine sparkling by bottling with sugar or back sweeten it by adding sugar and potassium sorbate. HyYes, rouge sur blanc does mean red over white if you translate it word by word, but you can’t always translate an expression word by word. In that case our expression (i’m french) means red before white and white before red.